Canadian natural gas prices on the spot market hit an intraday low of $0.05/mcf earlier this month—that’s FIVE CENTS per thousand cubic feet. That was a result of the massive forest fires around the oilsands hub city of Fort MacMurray, which has taken 1 MM bopd of heavy oil offline, and reduced natgas demand by about 1 billion cubic feet per day (1 bcf/d). Obviously, nobody makes money at those prices. But it sure beats the negative pricing—of over $1/mcf—that some spot sellers have had to endure a few days this year in Canada. That’s right—producers paid to produce their gas—and not just a little bit; A LOT—over $1/mcf! The well-hedged Canadian natgas producers however, are laughing all the way to the bank. Seven Generations (VII-TSX; SVRGF-PINK) has a robust 55% of current natural gas production hedged for the balance of 2016 at an outstanding C$4.00/Mcf, while the much smaller Delphi Energy (DEE-TSX; DPGYF-PINK) has hedged approximately 74% of their natural gas for the rest of 2016 at an even better C$4.20/Mcf. I can’t think of another group of energy producers as Canadian natgas producers who see such different hedged vs. non-hedged pricing. As an investor in Canadian natgas/condensate stocks, the obvious #1 question to ask management teams is now—how much are you hedged this year and next? It’s hard to argue that they shouldn’t be hedging the maximum allowed—which is usually about 50% of production. If a producer hedges more than that, they leave themselves open to the potential of pipeline outages or perhaps even forest fires creating a situation where hedging becomes speculating if they can’t produce or sell as much volume as they have hedged. That makes the risk of hedging over 50% is somewhat limited. However, the more a producer has hedged, the less upside they have IF commodity prices do rally significantly. Producers selling into the Canadian spot market have had every Bad Luck Brick thrown at them in the last two years. 3) Thanks to the warm winter due to the weather phenomena known as El Nino, Canada is already at roughly 70% of natural gas storage capacity and the traditional injection season has barely started! Total storage in Canada is 66% higher than 2015 (as of April 30). The story south of the border is not much better with current storage levels of 2,681 BCF being over 800 BCF above both last year and the 5 year average. 4) Massive wildfires around the oilsands hub of Fort MacMurray, reducing demand by 1 bcf/d. Yes, all the fires in the oilsands has had a HUGE impact on natural gas—whether it be the utilization of gas to generate power for the upgrading process or to generate steam for injection into SAGD wells, the current estimate of lost demand for natural gas from this alone is ~1 Bcf/d—about 25-33% of production! This has in turn resulted in the AECO (the name of the Canadian benchmark natural gas price)-Henry Hub differential widening to US$1.10/MMBtu last week. 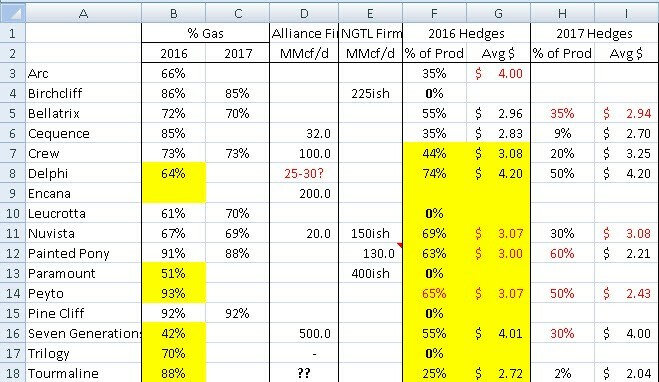 This compares to the 2015 average differential of US$0.50/MMBtu (In winter months it can be as low as US$0.30/MMBtu).With the Henry Hub June natural gas contract trading right around the US$2.00/MMBtu mark, the math isn’t very compelling for an unhedged producer in the WCSB. Now, the 2nd question you want to ask of Canadian natural gas producers is—through which pipeline do you sell your gas? Because again, the price differences between them are….remarkable. The Alliance pipeline gets the best pricing for producers. This pipeline delivers production to the Chicago area. The Chicago price for dry gas has a fairly high correlation to Henry Hub pricing, and remember that has been as high as $1.10/mcf more than Canadian gas—close to double. DOUBLE. So specifically ask management or search in the financials—how much of your gas do you sell via the Alliance pipeline. There are two other export pipelines. TransCanada’s NGTL pipeline gathers more than twice the natural gas in Western Canada than Alliance or the third pipeline system—Spectra—combined. Accordingly NGTL becomes the de facto benchmark for pricing. The Spectra system primarily gathers gas production in B.C., and although it can deliver into Alberta to access the other two export options, its pricing is driven mostly by demand from the B.C. Lower Mainland, Washington State and beyond (albeit via connecting pipelines past the Canadian border). All three locations will have regional supply/demand implications that impact the respective prices, but generally follow seasonal pricing closely. However, if a producer hasn’t committed to “Firm Service” capacity (essentially a take-or-pay commitment on the pipeline), then field pricing can get really crazy if there are regional issues or outages on a pipeline or at a particular gas plant when production exceeds take away capacity. This mostly happens just on the NGTL pipeline, because both Spectra and Alliance have virtually all of their capacity committed to Firm Service agreements. With all this in mind, if you are a Western Canadian natural gas producer with no Firm Service and no hedges in place, the world is a pretty ugly place right now. Birchcliff Energy (BIR-TSX; BIREF-PINK) and Paramount Resources (POU-TSX; PRMRF-PINK) both have significant Firm Service contracts on NGTL, but it’s really only Alliance capacity that serves as a quasi price hedge and both of these names have none of their natural gas production hedged at present. Trilogy Energy (TET-TSX; TETZF-PINK) and Pine Cliff Energy (PNE-TSX; PIFYF-PINK) are another pair of producers who are completely unhedged on the natural gas side and have the other exposure of no Firm Service agreements, Trilogy having not renewed their Alliance Pipeline capacity effective Dec, 2015. There isn’t a very compelling picture for natural gas prices over the next few months. Sure the bulls will highlight that US production has rolled over and that demand continues to grow but storage continues to hit record seasonal highs. If oilsands production continues to be impacted by the uncertainty of the current fire situation, storage could fill at even faster rates putting even more pressure on the spot AECO price. But this leaves un-hedged natural gas weighted producers exposed to some serious price risk. Canadian producers such as Crew Energy (CR-TSX; CWEGF-PINK), Delphi Energy, Leucrotta Exploration (LXE-TSX; LCTRF-PINK), NuVista Energy (NVA-TSX; NUVSF), Seven Generation Energy and Tourmaline Oil Corp (TOU-TSX; TRMLF-PINK) have Firm Service on the Alliance Pipeline. Of these names all but Leucrotta have hedges in place for 2016 and 2017. Companies like Bellatrix Exploration (BXE-TSX/NYSE), Painted Pony Petroleum (PPY-TSX; PDPYF-PINK) and Peyto Exploration (PEY-TSX; PEYUF-PINK) have solid hedges in place but definitely face greater price risk on their non-hedged production. While names like Trilogy, Pine Cliff, Birchcliff and Paramount Resources are fighting an uphill battle to achieve positive cash flow in the near to medium term. 2) producers with Firm Service on Alliance or to a lesser extent Spectra, or a robust hedging program or preferably BOTH, to best survive the lean times ahead. These producers are best situated to escape the doldrums of the domestic market and it’s seemingly never ending depressed pricing. Next post: The Most Profitable Word in Energy is…. A major trading classification of sweet light crude oil comprising Brent Blend, Forties Blend, Oseberg and Ekofisk crudes (also known as the BFOE Quotation). It's sourced from the North Sea & is the leading global price benchmark for Atlantic basin crude oils. It is used to price two thirds of the world's internationally traded crude oil supplies. Originally Brent Crude was produced from the Brent oilfield. The name "Brent" comes from the naming policy of Shell UK Exploration and Production, operating on behalf of ExxonMobil and Royal Dutch Shell, which originally named all of its fields after birds (in this case the Brent Goose).